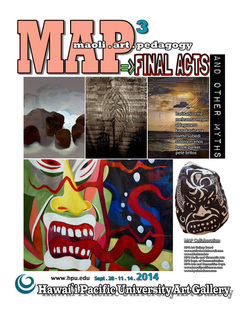 MAP (maoli.art.pedagogy) encompasses a series of exhibitions at Hawai`i Pacific University Art Gallery featuring Hawaiian Artists. Contributing Artists include: Carl F.K. Pao, Meleanna Meyer, Kazu Kauinana, Haranani Orme, Al Lagunero, Kahiau Beamer, Lilette Subedi, Solomon Enos, Kahi Ching, Pete Britos. Maoli . Art . Pedagogy (MAP) creates discourses about art in Hawai`i, especially as it pertains to the community and institutions of learning and teaching. For the series, MAP artists created and exhibited paintings, illustrations, sculpture, music, digital media and audio-video productions. MAP is an exhibition that features Kanaka Maoli artists exploring the intersections of art, teaching and learning in Hawai’i and the world. The artists include Carl F.K. Pao, Meleanna Meyer, Al Lagunero, Harinani Orme, Kahi Ching and Pete Britos. With the metaphor of the MAP as a framework, the artists consider how Hawaiian art teaches, re-members, explores, proposes, suggests, excavates, challenges, honors and envisions the past, present and future. What is the place of Hawaiian art in our Hawai’i culture, in our personal lives, our community, and in our understanding of what has been, and what will become? The piko, the heiau, the human body and the ki`i image are powerful symbolic sites of engagement and contestation, that intersect as well with institutional and commercial culture. In this age of pop culture saturation, and cookie cutter aesthetics, how does Hawai’i and Hawaiian art function, and what is the role of the Maoli artist? The exhibition includes insights and video commentary from the artists and other kahuna practitioners, like anthropologist Lynette Cruz and kumu hula-genealogist Cy Bridges. MAP2 explores the interface of Hawaiian art, our local and global communities, and pedagogy. Building on the 2012 MAP exhibition at the Hawaii Loa Gallery, this year's exhibition specifically addresses the issue of visualization and the future. Like last year, a selection of Maoli artists have been invited to address the MAP2 themes. The artists work in a variety of media, from sculpture, to painting, illustration, concept art and installation, graphic design, model building, murals and animation. A popular Hawaiian saying suggests that: ka wa mamua, ka wa mahope. "the past is before us (what we face), and the future is behind us (what is to come). The saying provocatively underscores that visualizing the future can be a matter of where one stands, or comes from, culturally, psychologically, geographically. Hawaiian artists in Hawai'i of course come from a unique island environment, and operate in the capacity of translator and transmitter of past, present and future for its peoples. These artists then function as guides and teachers, and are most often deeply rooted in multiple cultures, drawing on a wide variety of disciplines and traditions. Artists in MAP2 include Kazu Kauinana, Solomon Enos, Lilette Subedi, Kahiau Beamer, Pete Britos. There are many metaphors or analogies that could be mobilized within the framework of M.A.P. (Maoli . Art . Pedagogy) and/or FINAL ACTS. An obvious metaphor for FINAL ACT is DEATH. Also there is the theatrical analogy: third and final act—signaling: narrative closure, climax, catharsis and denouement. In this theatrical sense the notion of “play”, or to “act” has been invoked. What do we leave behind? What is the footprint? Or not. Often times a final act is spontaneous, or the work of decades, lifetimes, beyond even—we don’t always see what it is until the moment is well behind us. Sometimes a final act defines or redefines everything that has come before it, sometimes it does not; sometimes it is private, sometimes it is not. A final act then is about more than finality, it’s about summation, incompleteness and starting anew, planting seeds that you might never see come to fruition. Poetically final acts are journeys that will be forgotten when memory disappears. MAP2 invited participating artists to KUKAKUKA at the HPU Gallery with students and community members. The event was blessed by Kumu Lilette Subedi and lead by artists Al Lagunero who flew in from Maui, and Meleanna Meyer of O`ahu. It was recorded on high fidelity video for posterity, and a documentary is being edited of the series. MAP artists Carl F. K. Pao and Meleanna Meyer visited the HPU Fort Street Mall campus to speak publicly with students, faculty and staff. The artists brought art to share, and spoke for over an hour with about 100 students, faculty and staff. Students video taped the presentation and got rare one-on-one time with some of the most knowledgeable local artists on the island of O`ahu. M.A.P. collaborators: HPU Art Gallery Board, Na Mea Hawai`i Native Books, Black Sand Productions, HPU Media and Cinematic Arts, HPU Department of Communication, HPU College of Liberal Arts, Native Hawaiian Speakers Series, the Kalamalama, Hawaii Pacific News, Hawaii Pacific Network.